What was the last time I ride on a bicycle? Well… whatever I could remember, that day was just few days before my graduation from IUT. That was in the year 2006. It doesn’t mean that before that I was a regular cyclist. I rode that day after… let me guess… eight years. And after my last cycle riding in Bangladesh, I am now cycling everyday in the Netherlands. In the Netherlands, almost everybody has (minimum) one bicycle. It is the most common transport in the Netherlands. They have completely separate lanes for the bicycles along side the streets. These lanes are made in such a manner that any one can travel the whole country with a bicycle. Let’s come to the main topic. Well… at last I’ve bought a bicycle. It is a mountain bike, having different gears on it. I am using it mainly for going to the faculty building from train station. I keep it in the Delft-Zuid station along with hundreds of other fiets. Oh I forget to mention that they call the bicycle as fiets. And don’t think that I am going to tell you that I’ve bought a car also! Actually for the first time I’ve sat on a car’s driving seat which is in left side. It was my uncle’s car. He gave me chance to drive his car. But the left handed drive was seemed to be totally mirror looked image for me. Because I was used to drive the right hand sided cars in Bangladesh. But here when I got to the car I has to change my gears with the right hand whic is not usual for my right hand. Also the car indicators have to be controlled by left hand. It seemed that I am watching the total system through a mirror. It takes time to be adjusted with this new systems. Here comes the most interesting part, Baarle-Nassau. Last Saturday I went there with my Mama (my uncle), Zuaer and Enka (both are neighbors). It is a border town of The Netherlands and Belgium, or to be more precisely a common town. One part of this town is in The Netherlands and other part is in Belgium! The border line divided the town into two parts. And you’re free to cross that border anytime. The interesting part is, there are some houses which has two doors; one in Netherlands and another is in Belgium. This town has town has two municipalities for two countries. Not only municipalities, but it also have two police stations, fire stations, two hospitals and so on. Just imagine suddenly you are sick and you fall just over the border line such a way that half of your body is in Belgium and the other half is in the Netherlands; what will happen then? Well they said neither of the two hospital’s ambulance will take you to the hospital, cause you’re in a confusing state. Ambulance from Belgium is allowed to take your Belgium-body-part but not the Netherlands-body-part and so the Netherlands’s ambulance. It’s Zuaer’s idea! Well, the whole town is a tourist spot. To the addition, on that Saturday, there was a rally of vintage cars. For the first time in my life I speculated the vintage cars from 1940 and later in real life instead of websites or magazine. And here comes another idea from Zuaer; it may be possible that a bathroom in a house may be on the border line. That means people of that house may have a chance to brush their teeth in Netherlands and have their bath in Belgium, and it is an everyday routine! 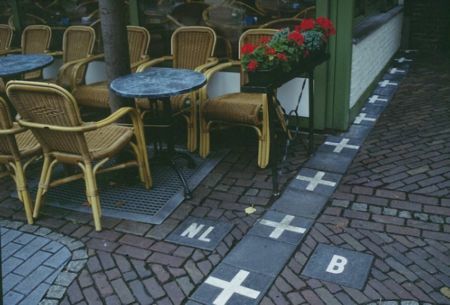 Border line of the Netherlands and Belgium. 'B' indicates Belgium and 'NL' indicates the Netherlands. And the border line goes through a coffee shop! 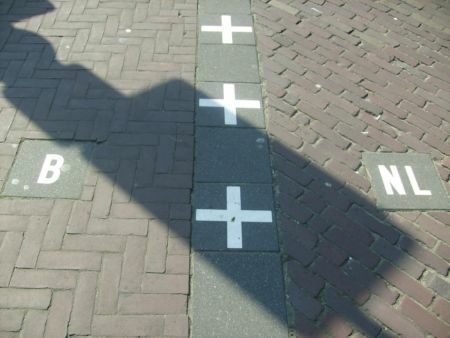 Another Border line from Baarle-Nassau. And this time this line is on a footpath!